Is this revamp of a classic big and beautiful, or a bust? The ECI5 MkII replaces the ECI5, which in turn replaced the ECI4.7. Rather confusingly, the changes involved in going from the 4.7 to the 5 were generally considered detail ones, but warranted a new model number. In contrast, the MkII has virtually no components in common with the MkI, but retains the model number! This might prove a challenge to dealers and customers, but we are sure everyone will manage. The ECI5 MkII is a 120 Watts per channel integrated amp finished in the company's traditional casework, complete with a thick Perspex front panel and a quartet of control buttons – left and right selecting inputs, and up and down controlling volume. Aesthetically, this rather divides opinion. Some people love the rather retro-futuristic appearance and others regard it as a fingerprint magnet and dust trap. The MkII introduces a neat LED display to show the selected input in place of the older backlit 'block' design. This is easy to read and a marked improvement on its predecessor. We had hoped that this might have included the facility for the ECI5 MkII to default to the last selected input – something that the ECI5 and ECI3 cannot do – but the MkII selects the first balanced input on start-up, whether you use it or not. The casework is comparatively large, with the ECI5 MkII nearly half-a-metre wide and over 400mm deep. This means that most equipment racks will struggle to accommodate it and you will most likely need to place it on a top shelf. The fit and finish is extremely good with negligible panel gaps, excellent paint finish and the casework seems less resonant than on some older models. This also contributes towards the impressive 20kg weight. Mention must also be made of the excellent quality speaker terminals and input connections that feel superbly over-engineered in use. Internally, the only major component retained from the older model is the transformer. This is understandable, given Electrocompaniet's use of its distinctive floating transformer technology (FTT). Otherwise, the MkII takes the basic premise of the original ECI5 and makes substantial improvements. The MkII doubles the number of output devices used to improve bass control and stability when driving difficult loads. This is further improved by the larger bank of reservoir capacitors, which allow for greater current delivery. In practice, the ECI5 MkII is unlikely to struggle with any speaker design at a comparable price point, including electrostatic and planar designs. Like virtually every other Electrocompaniet component, the ECI5 MkII is a fully balanced design and sports a pair of balanced inputs to take advantage of this. 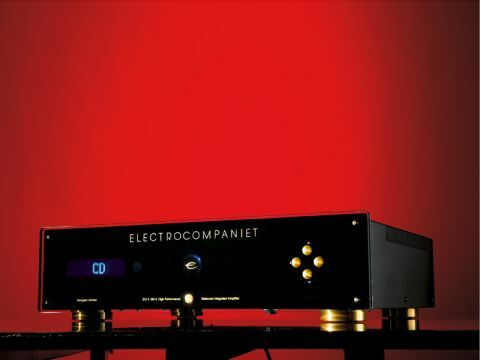 Electrocompaniet makes no apologies for preferring the balanced connections and, to this end, supplies a set of RCA-XLR adaptors to allow any would-be owner to experience at least some of the benefits, even if his or her source equipment isn't equipped with XLR outputs. The ECI5 MkII is also fitted with a balanced preamp output, allowing it to connect to a matching power amplifier, either in a bi-amping configuration or exclusively as a preamp. The other four line inputs are the conventional RCA type. The ECI5 MkII has to be considered relatively good value. The build quality is up to the standard we would expect and it supports a healthy number of inputs with full remote control. Most importantly, the amplification stage itself appears to be well thought-out and comprised of high-quality components. The 120W output seems believable under the circumstances and means that system building around the Electrocompaniet should not be very difficult. Sonically, the ECI5 MkII is classic Electrocompaniet. The defining characteristic is an extremely wide soundstage, which seems to extend well beyond the physical placement of loudspeakers. This enormous sense of space gives the ECI5 MkII a relatively easy job when placing musicians and instruments coherently in relation to one another within it. The large soundstage does have a habit of persisting, even when listening to small recordings, so there can be slight loss of intimacy to their reproduction, since they're given more space than perhaps they had in reality. Many will accept this trade off for the sense of realism that the ECI5 MkII can bring to proceedings with larger-scale recordings. This performance is complimented by excellent bass response. The bassline of any recording is presented with a force and weight that helps the overall sense of realism greatly. This low-end force is deceptive, because despite the considerable heft that the Electrocompaniet has, there's no sense that it overwhelms the more delicate upper frequencies, or is out of proportion to the rest of the performance. There's also a useful speed to the bass response – it starts and stops with commendable speed and helps give the ECI5 MkII a sense of timing and poise that we have not experienced with older designs. In terms of tonality, the ECI5 MkII is a strong performer, if not a perfect one. The amp can sound fabulously real with vocals both solo and group, but instruments can occasionally sound fractionally flat and recessed by comparison. This is not hugely pronounced and may simply be a reflection of how adept the ECI5 MkII is with vocals, but it can contribute to a wider sense that – like some other Electrocompaniet designs – there is a slight sense of smoothing off absolute detail and losing some excitement and vitality as it does so. Depending on what you're looking for, this need not be a bad thing. It helps the Electrocompaniet stay entirely listenable even when playing back poor or harsh recordings, and the overall performance is so civilised that you can listen to the ECI5 MkII for hours without it ever becoming grating or tiresome. Equally, there will be those who would prefer a little more excitement in their replay and are happy to accept that their listening may not be so even-handed. Here, the Electrocompaniet may prove too smooth and relaxed. The ECI5 MkII has much to commend it. It takes many of the traditional Electrocompaniet virtues and builds on them, adding a much-improved sense of timing and rhythm that gives a greater sense of life and enthusiasm to complex material. This is coupled to a useful power output that should handle most loudspeakers that it is likely to be partnered with in most domestic listening environments, and a useful selection of inputs and outputs. The calm, unforced presentation may prove too laid back for some and this lack of perceived excitement may put off those who want a more forceful performance. Others will enjoy the way that the ECI5 MkII goes about making music and find it is exactly what they're looking for.